New and Dubai used car owners are required to upgrade their license plate number by 2020, RTA officials have announced. The RTA also announced that the rule would apply to cars that are registered under private companies, government departments and to private owners. Additionally, as of January 2019, they will start issuing the new generation of redesigned number plates. “As of July next year, RTA will start the mandatory issuance of the new plates to vehicles registered in the name of public and private organisations,” official statement by the RTA claims. The cost of changing the license plate ranges from AED 35 for short plates and AED 50 for long plates. The decision to change the Dubai used car license plate number falls in line with the goal of standardizing Dubai design plates. The upgraded license plate will feature three key elements: Dubai code, number and brand. You can log on to RTA’s website in order to change your license plate. In addition, you can also pay for it online and pick it up from the nearest RTA center. You need to give your new or Dubai used car plate details. You can pick a style of your choice. For extra charges, you can select the colored Dubai logo. After you have designed your new plates, you can select your nearest RTA centre from where you can get the upgraded license plate. Payment can be made on the website. Get your Dubai used car number plate upgraded as soon as you can so that you don’t get in trouble with the RTA. For more such news, hop onto CarSwitch.com for latest car news in the UAE. If you are buying or selling a used car in Dubai then make sure that you get the new plate at the time of RTA transfer. You can also check out our grand inventory of pre-inspected and warrantied Dubai used cars! 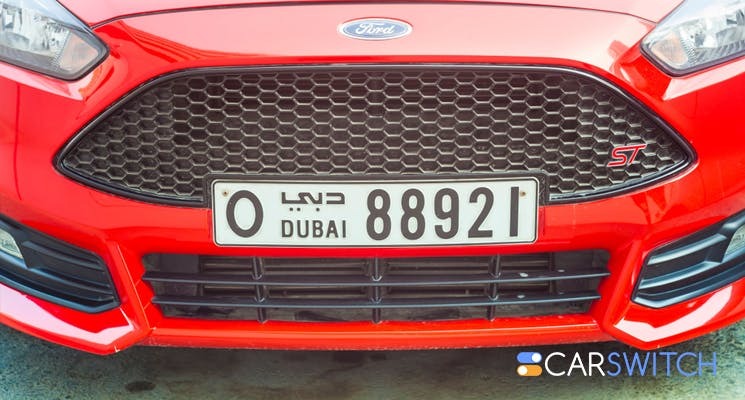 We all know that every new and used car Dubai requires a number plate. Now with. People who are taking their driving tests soon, here’s some interesting news for you! You will. There's good news for owners of used cars in Dubai! From 8th to 10th April, some.